What are the different types of statements in C#? How to use statements in C# programming? What is structures and Enumeration in C#? There are various basic things in C# that you need to know. These are very small but too effective. These are called statements in C#. Without covering statements in C#, you can’t be a good programmer. In C# programming, there are various statements as a block, empty, goto-label, break, continue, return, throw, checked, unchecked, lock, using etc. These are small but give powerful control you to write your program. 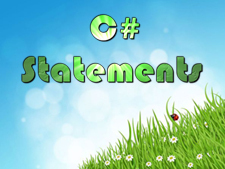 In this session you will learn about different types of C# statements as goto label statement, break-continue statement, return statement, throw statement etc. You will also learn about enumeration and structure in C#. In next chapter you will learn about Block Statement in C#.